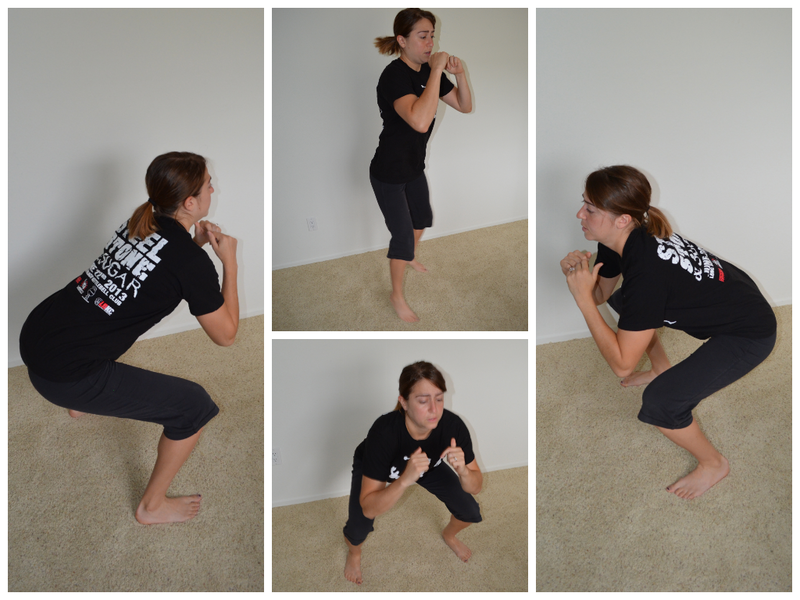 The basic bodyweight squat is a great move and often overlooked because it seems so simple and well….easy. Most people add weight to the squat to make it more challenging. But what if you don’t have weights at home yet have progressed past the basic bodyweight squat for reps? 1. Bodyweight Squat Hold – Holding a basic bodyweight squat at the bottom (aka when your thighs are parallel to the ground and your knees are bent to 90) isn’t by any means easy even if you can squat with quite a bit of weight. Try holding for 30 seconds to 1 minute…or maybe even 2 minutes. Do not let your chest fall forward (aka do not lean forward) and make sure your weight is in your heels. Do not sink below 90 as that makes the squat easier. Beginners may need to perform a shorter hold or hold up a bit higher. 2. Wall Sit – This is a variation of the Squat Hold and equally as torturous. If you have trouble holding at 90 during the Squat Hold or if you lean forward, a wall sit will be the best option for you. Sink down to 90 and drive through your back into the wall. Sit up nice and tall. Hold for 30 seconds to 1 minute. If this doesn’t feel incredibly challenging, you can do a single leg wall sit. Raise one leg off the ground and hold it straight out in front of you (the straighter out in front of you that you hold the leg off the ground, the more you will work that quad as well). Try a 30 second to 1 minute hold on each side. 4. Slow Reps – Everyone always wants to go faster. No one ever wants to SLOW DOWN. And why is that? 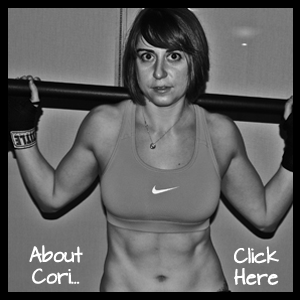 Because slow reps are AWFUL…aka REALLY HARD AND TORTUOUS! Try taking 5 seconds to lower down to the bottom of your squat before exploding back up to the top. Or try a 2-3 second lower, 5 second hold at the bottom and then a 2-3 second press back to the top. Mix it up. There are a ton of ways you can slow down the tempo. Just slow it down. Shoot you can even go quickly down, hold at the bottom for 5-10 seconds and then pop right back up! 5. Jump Squats – Just like slowing something down makes it harder, so does making something more powerful and explosive. With jump squats, it isn’t about performing a super deep rock bottom squat. You actually want just a little squat/hinge to load so that you can explode up. Squatting too deep can actually hinder your ability to be super explosive and jump high. So perform a more shallow squat and explode as high off the ground as possible. Beginners may need to rest between each rep. To make the move harder, jump up and sink right back into the squat to repeat. Really focus on a soft landing. You should never land with your legs completely locked out unless you want to hurt your knees. SOFT KNEES! Bend your knees to help you absorb the impact of landing. 6. 90 Degree Hops – A variation of the squat jump where you not only explode up, but also rotate 90 degrees to each side. With this move you can either focus on getting high off the ground OR on staying low and moving quickly. Both can really make the legs burn. 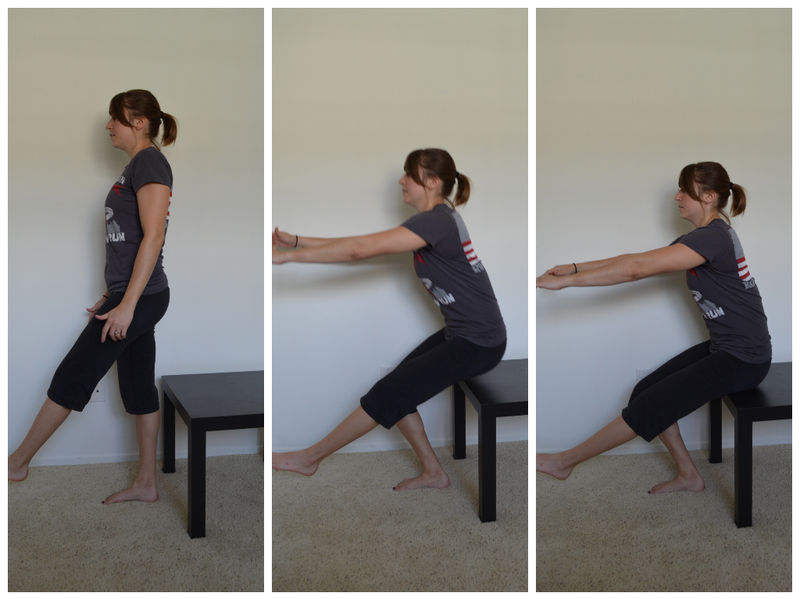 I love this move because it isn’t just a simple sagittal plane squat! Just like the basic jump squat, you need to remember to focus on a soft landing. 7. Staggered Stance Squats (and or Jumps) – A great way to work each leg individually without doing a single leg movement, is the staggered stance squat. Place one foot in front and the other foot about hip-width to shoulder-width apart and a bit behind the front foot (the back toe should be about even with the instep of your front foot). Squat down as low as possible, keeping your weight in your front heel. Do not worry if the back heel comes up. Do not lean forward or let your back round. Complete all reps on one leg and then switch to a staggered stance on the other side. To make this move harder, you can do one of two things – you can do a staggered stance squat jump or you can do a slow tempo staggered stance squat. 8. Single Leg Squats to Bench – This is a progression toward a pistol squat and a great way to correct any imbalances because the legs work individually. I did it with my IKEA table, but you can use a chair or bench or well…a step stool. Anything that is the proper height that you can sit down to. The lower the “box,” the harder the move. Start by sitting on the bench. Place one foot solidly on the ground with your heel right under your knee. Lift the other leg off the ground. I like to hold it out straight to make the quad work. Stand up straight. Try not to lean forward as you stand. Sit back down, controlling your decent as much as possible. As with all squat variations, you can slow down the tempo to make this move harder! 9. Single Leg Squats Using a Wall – This is more challenging than the squat to bench unless you have a super low box and have great control over your decent. Stand in a doorway with your hands on the each side. Straighten one leg out. Sit back into your heel and walk your hands down the wall as you squat as low as possible. Once you go as low as possible, walk your hands back up and drive through the heel back up to standing. Try to pull up with your hands as little as possible. Use the wall for support only as much as needed. Do not rock onto your toe. Drive off the heel as much as possible. Really keep your core engaged as you perform the move. Do not worry about your back being completely straight. 10. 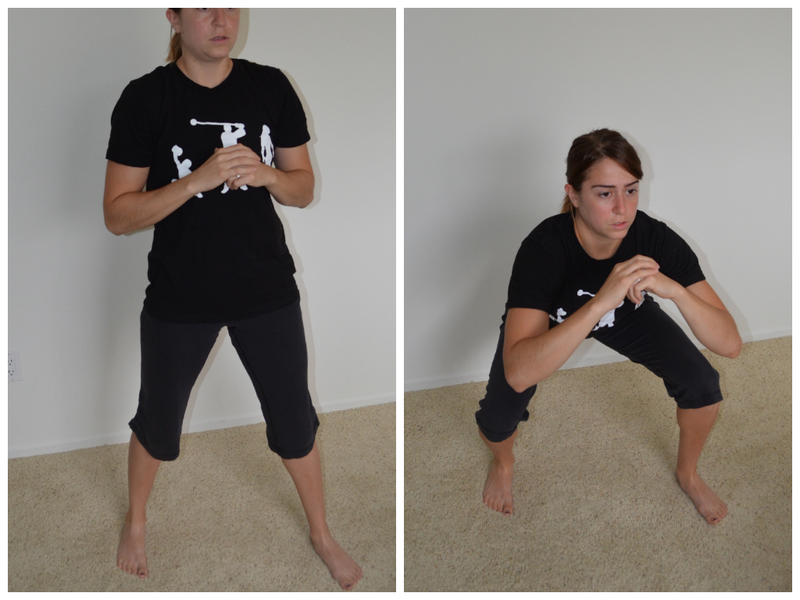 Pistol Squats – Basically this is a single leg squat with no support! Go as low as possible, holding the other leg out straight. Drive up through the heel to come back to standing. 5 minutes of bodyweight squats – A great way to get in some cardio and work the legs using the BASIC BODYWEIGHT SQUAT is to set a timer and do as many reps as possible in the time allotted. I like five minutes. It is just long enough to be awful, but not so long that you need to take long rests. Work your way up to five minutes if you are a beginner! What is your favorite squat variation without weight? Posted on July 31, 2013, in Man Biceps, program development, Top 10 and tagged bodyweight squats, single leg squats, Squat, squat variations. Bookmark the permalink. 5 Comments. This is fabulous. If you asked me to name variations of body weight squats, I don’t think I could come up with half this many. 🙂 I would add plie squats on toes though – one of my favs. Oh never do that one…I’ll have to try it! But I would definitely say sumo/plie squat is a good one!!! I like sumo/plié squats and jump squats. There are a few on this list I need to try! Yea sumo squats and jump squats are great!